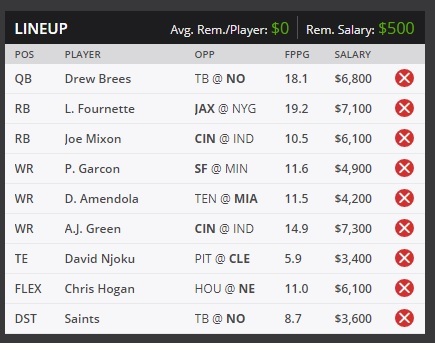 Drew Brees leads the way in this early only lineup and should be a solid play. Leonard Fournette is set for a huge week and will be worth the $7100 salary. I also like A.J. Green to have a monster week as well. On defense I really like the Saints this week, the Bucs are going to have a hard few weeks before Jameis Winston comes back.